We live in a world of shadows, and every shadowy place that has been, or will ever be, has first resonated from within the hearts of men. We are the architects of those shadowy places, which first begin as specks of darkness within the heart, but grow larger and larger the more we bind ourselves to sin. We are the draftsmen of our own destruction, and the shadows that originate from the heart eventually grow so monstrously large, that they begin to manifest themselves to the visible world, as Matthew’s Gospel reads, “For out of the heart proceed evil thoughts, murders, adulteries, fornications, thefts, false witness, and blasphemies” (Matthew 15:19). And the more I learn and discover about the world and the people living in it, the larger these shadows seem to be. Each day lays claim to its own unique set of tragedies which seem hell-bent on outdoing the horror of days prior. And whether it’s a gut-wrenching headline cascading across a particular news outlet, or something offensive and morally obtrusive that we witness at a personal level, it leaves an impression on the heart. And as we have mentioned previously, some of these impressions are self-inflicted, lest anyone think they are without reproach. We are not only pierced by the sins of others, but by the sword of our own sins. And out of sheer frustration and disdain for such things I often find myself searching…searching for hope, searching for God. Where is God? Where is God in a world that is crumbling, in a world encompassed by shadows? In order to arrive at our answer, we must begin by searching the same place from where the shadows are born, the heart. If we choose only to fixate on the shadows, then that is what we will always see. If we gaze upon the night sky and choose only to focus on the darkness, would we not deprive ourselves of the radiance and beauty that the stars exhibit? Does not the light, in fact, draw us out of the darkness? Why then should it be any different when peering into the depths of our heart? As it is, no heart is devoid of hope, as all men are fashioned by Him Who is the very essence of light, Who entered the world to save it, and to draw all men out of the darkness of their hearts and into the light, as 2Corinthians 4 reads, “For it is the God who commanded light to shine out of darkness, who has shone in our hearts to give the light of knowledge of the glory of God in the face of Jesus Christ”. Now it’s one thing to simply quote scripture, but another entirely to invite the light of Christ into our hearts. And it doesn’t transpire by way of wishful thinking or sheer happenstance, but through humbled intention. This morning’s Gospel from Luke 14 is a perfect example of the transformative effects of a humbled heart. Here we learn that the man who deliberately places himself at a place of honor among others does so out of self-worship, and will be abased in the sight of others, but he that places himself as being the least among all others, will be rewarded. Doesn’t this passage mirror another particular verse within scripture? A pureness of heart requires a deliberate level of humility on our part. We must be truly humble in order for God to dwell within our hearts. But what does true humility look like and how do we acquire it? This question hovers over me daily, because putting it into practice is a constant struggle, a war between the cares of my sinful flesh and the desires of my spirit. Even our quest for humility is not without its sinful dangers. The most important thing we, as Orthodox Christians, are responsible for, as Bishop Thomas lovingly reminds us every time he comes to visit, is working out our own salvation on a daily basis. However, this can be done in an incorrect manner if we take on such a task outside of the blanket of humility. Our pursuit of salvation can very easily become a selfish one if we allow ourselves to be the focus and not Christ. We can very easily become the object of our salvation if we take a legalistic approach or view it as an arduous process. A person who observes the fasts for the sake of fasting is not abiding by the true spirit of humility. Likewise, someone who does something nice for another because of the “high” they get from it personally, is not truly seeing Christ in that person, but rather doing something to simply feel good. 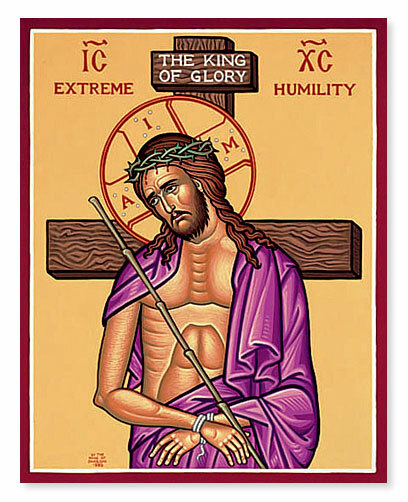 True humility requires that we search inwardly into the depths of our heart, not in a way of puffing ourselves up, but as method of selfless introspection with the hope of opening ourselves up to the transformative light of Christ. We do so, as Paul describes in this morning’s Epistle, so “That Christ may dwell in your hearts by faith”. When Christ dwells within the heart, the inner man is transformed, and there is no room for anything or anyone else, for God is indivisible and all-encompassing. During my week’s residency at Antiochian Village, all of us students and faculty were blessed by the visitation of his eminence Metropolitan Joseph. And for many of us, this was our first contact with him, so we didn’t quite know what to expect. He was certainly much taller than I had imagined him, being well over 6 feet tall-in fact probably closer to 6’3”, or 4”. But for as much as he seemed to tower over almost everyone at the Village, his height certainly didn’t translate when it came to his spiritual demeanor. During the Gala dinner, which occurs at the end of each week of residency, he gave a speech, one which I will never forget. He spoke to us about a certain man that had approached him a year prior, who was deeply concerned with how he would govern as newly installed Metropolitan. And the man began by telling him of all the things that the previous Metropolitans had accomplished for the Antiochian Christians here in America. And pointing his finger at Metropolitan Joseph, the man said, “Now, what are you going to do for us?” To which the Metropolitan replied, “My mission is to save souls. Let us do this together”. My friends, a humbled heart is concerned about saving not just his own soul, but the countless souls of others. A humbled heart has no time for boasting, nor does it seek personal gratification. A humbled heart is rooted and grounded in love, so that the love of Christ might fill you with the fullness of God. Towards the beginning of our discourse I asked the question, where is God? Where is God in the midst of a world of shadows? My friends, God is present in a humbled heart. It is there that He makes His home. And so our Lord is asking each of us here this morning the question: what is the current state of our heart? Does it pursue humility above all else? I don’t know about you, but my heart is in need of transformation. My heart is need of Jesus Christ. If the whole world would only abide in the humility of Christ, well then, the shadowy places wouldn’t exist, for we would only see light. Nevertheless it is possible! But is begins with our taking inventory of our own hearts on a daily basis, it requires a deliberate effort to welcome Christ into our hearts. To those to whom the peace and humility of Christ rules within their hearts, salvation will surely not be far from them. As his eminence Metropolitan Joseph commissioned, let us go forth into the world saving souls, with the humility of Christ, Christ our champion over the darkness, and may the perpetual light of His countenance shine upon us forever. There can be no resurrection without first a birth and then a death to precede it. Man, though he possessed the image and likeness of his Creator, evicted from himself the eternal nature in which they once shared; for by way of Adam's sin his incorruptible body succumbed to corruptibility, and hence death opened its doors to all that would come after. However, this was only the beginning of man's self-imposed desolation, for he surrendered not only to death, but to the vanity and corruption that accompanies it. He fashioned idols to replace the God that grew smaller and smaller in his heart, and when he became tired of them-or they had lost their magic, he went and fashioned more; all stemming from his gluttonous desire to seek and worship a so-called deity of his own design and control. Through their envy, they swallowed the lies of that ancient adversary, the devil, and feasted upon the rotten fruit of their own sins; perishing, though oblivious to it, more and more with the passing of each day and all but rendering the image in which they were created unrecognizable. Few remained faithful in those days to the One true God, and yet, even they endured many hardships and travails; for they too, as were all men, slaves to the same death introduced by way of Adam's transgression. As we have come to learn, the purpose of Christ being wrapped in "swaddling cloths" is monumentally significant; in fact, the gospeler Luke upholds this truth by mentioning their use twice amidst his nativity account. So what, you may ask, is the significance? Swaddling cloths are burial wrappings, which affirms the one purpose of Christ's coming: to endure death. As Father has made mention, in the Orthodox icons of the Nativity, the Christ-child is depicted in these burial wrappings, and is done so to illustrate that the supreme purpose of the Incarnation was to make possible the Crucifixion and Resurrection. [vi] Even in birth, even in this festive Christmas season, Christ is pointing to the Resurrection, for it is for this reason that He came: to restore what was once lost long ago when Adam, through his sin, hung the curse of death around the neck of humanity. To be clear, no, we do not share the same nature as Christ, however we are called to lead godly lives. Christ, in saying, "You are gods", was not calling to mind the sharing of His divine nature, rather implicating the godship we have by way of us bearing His image and likeness. When we were created, we were made in the image and likeness of our Creator, according to our human nature, therefore humanity by nature is an image or icon of deity. However, as we have mentioned previously, this image and likeness was scarred by way of Adam's sin and man's hope of recapturing that unspotted image, that is to say, his ability to experience deification (the process of becoming more and more like God) was severed. Because of the Incarnation, the process of our being renewed in God's image and likeness was begun. Christ came to repair and restore, to make new what once seemed lost, what humanity could never give unto itself and yet it was that which humanity needed in order to be saved from its own destruction. In Christ we find our purpose, in Him we have the fulfillment of our human destiny, in Him we have our adoption, becoming by grace what God is by nature; whereby He calls us not servants, but sons, and if sons, then heirs. Think of it in this manner: two boys from the same foster home get news that they are to be adopted by two different sets of parents. Both seem excited at first, in fact, how could they not, for all children, at some point in their youth possess that root desire of acceptance and nurturing that only a parental figure can bestow. However, and quite sadly I might add, this is where the lives of the two boys differentiate from each other. The one, takes that excitement and uses it as a means of building a trustful and obedient relationship with his parents; while the other, once the excitement has lost its luster, takes issue with the ones who lovingly adopted him because their standard of living conflicts with his own. And as a result we have two separate outcomes for how these two boys will live their lives; the one, because he has spent years building a loving and trustful relationship with his parents will not just be unto them a son, but an heir to all that they have. The other, who ultimately rejected his adoption from its early stages, will always have an estranged relationship with his parents, because he never truly believed in them in the first place. And so it is with Christ; for in His Incarnation and glorious Resurrection, all have access to His adoption, but few truly honor it. My friends, no longer are we slaves to sin for we have been set free. No longer are we bound to the death of Adam for we are made alive in Christ. Christ has come and we are made new. Christ has come and we are reborn. Christ has come and his truth is now inscribed upon our hearts. Christ has come and the image and likeness of humanity has been restored. Christ, the Son of God has come and yet God our Father likewise calls us sons. Rejoice with me all of you, for the King of Kings and Lord of Lords has opened unto us the doors of His heavenly kingdom and we enter through that glorious threshold not as servants, but sons, and if we are sons, then heirs of all that was, is, and is to come throughout all ages of ages Amen. [i] St Athanasius, On the Incarnation, Nicene and Post-Nicene Fathers, Second Series, July 1999. p 39. 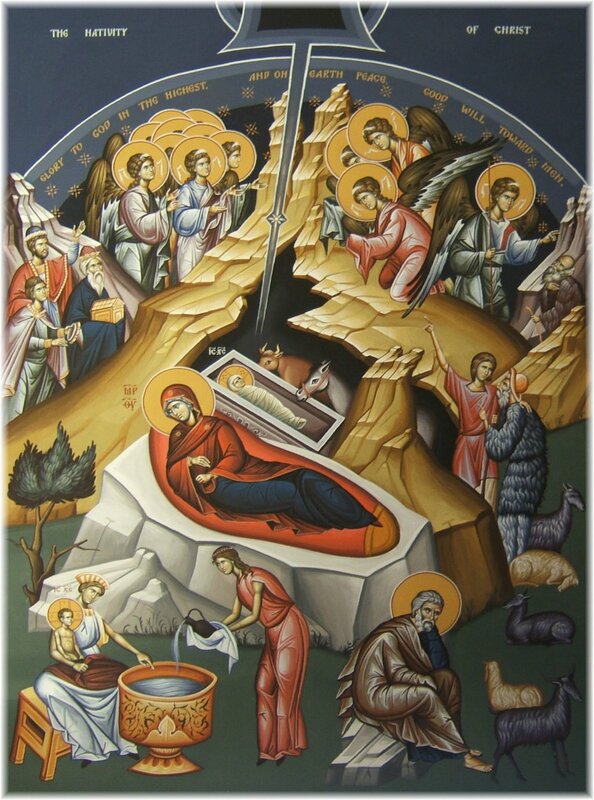 [vi] Dormition of the Theotokos Greek Orthodox Church, accessed December 27, 2013. http://dormitionpgh.org/tidbits/nativity_icon.asp. Follow three men on their journey to becoming western rite priests in the Orthodox Christian Church.